Why don't they sell milkshakes in gallon jugs? They sell yogurt that you drink, smoothie drinks, etc. Why not milkshakes? 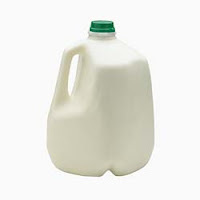 I would love to keep a gallon of low-fat, skim-milk milkshake in my fridge at work. High-protein energy for a man who loves milkshakes. That could be the slogan! Why doesn't this already exist? I think if you left a milkshake in the fridge, it would become milk!